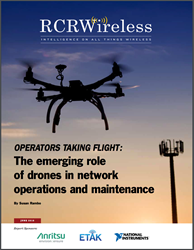 RCR Wireless News explores the role of drones in network operations and maintenance, including: performing dangerous tasks typically handled by telecom operators like tower climbing; conducting signal tests; evaluating sites for suitability, access routes and risks with drone-captured data; as well as get telecom infrastructure back online in wake of a disaster. Tower operators and network operators alike see the value in using drones for towerinspections and are increasingly using drones, especially since drone service vendors areoffering inspection flight automation, very accurate photogrammetry, HD video, and 3D data maps of the towers. Telecom operators are well positioned to take advantage of the growing commercial unmanned aerial vehicles (drone) market. Many operators have already embraced drones as an efficient and cost-effective way to improve network operations and maintenance. Tower operators and network operators alike see the value in using drones for tower inspections and are increasingly using drones, especially since drone service vendors are offering inspection flight automation, very accurate photogrammetry, HD video, and 3D data maps of the towers. Other benefits of drone inspections are increased safety and management of datasets. The big goal, and the big question — can drone-based tower inspections scale up to full networks? AT&T alone has 65,000 towers to inspect. Use of drones in tower inspections is cost-effective, provides valuable data and saves lives. In U.S., industry has what it needs to do inspections, with limited red tape. Automation is coming to drone inspections. All stakeholders in the industry favor some traffic management system for drones. Consolidation in the drone industry is on the way. Also be sure to watch the accompanying webinar, which features expert commentary from Lee Priest, CEO, ETAK.